Need Roof Cleaning & Pressure Washing Services In Wellfleet? Over time, the siding starts to look dull due to the buildup of dirt on the surfaces. The roof gets stained from years of soot. Algae can grow on any exterior surface where conditions are right. 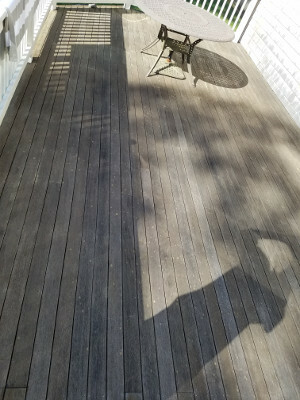 Unsightly stains can develop on the driveway. Concrete driveways, patios, and sidewalks turn dark and dingy. Often, raking, mowing, and hauling off leaves isn't enough to truly enhance your curb appeal. Exterior cleaning needs to be done by pressure washing in order to remove stains, algae, and mildew. 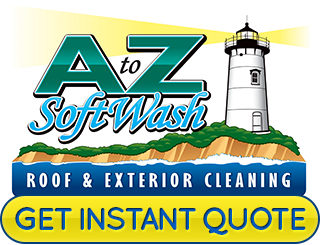 If you have a dirty exterior and need a professional roof cleaning & exterior house washing service in Wellfleet, call A to Z Softwash. Our professional Cape Cod roof cleaning and exterior pressure washing company is ready to tackle your dirty jobs. Need Roof Cleaning In Wellfleet? Dirt and debris not only makes your roof look bad, it's also bad for the roofing materials. You know those black streaks that make a roof look stained? Though not always, those stains are often caused by algae. When organisms like algae, mold, or mildew find a good environment to grow in, they start reproducing. The organisms use the building materials as food, which helps them reproduce. The stains are a byproduct that algae leaves behind after feeding. If left to grow, the algae will continue to consume the asphalt or wooden building materials of the home. If your Wellfleet roof needs cleaning, it's best to ensure the work gets done by professionals who will eliminate the algae problem. 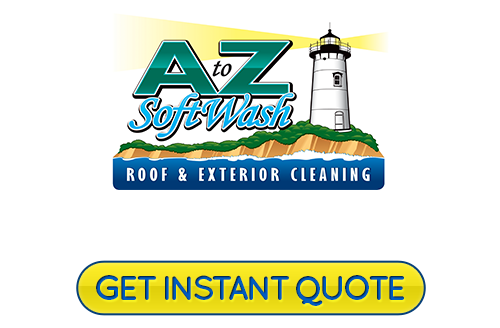 With one call to our experts at A to Z Softwash, your ugly roof stains will be eliminated. Our experts use safe softwashing techniques to clean your roof and other exterior areas. Have you taken a look out your windows lately? Are they getting hard to see out of? Is there grime and soot building up on the exterior? Are you able to see the view clearly, or does it look cloudy? If you need commercial windows cleaning services, call A to Z Softwash. We'll make sure they are safely cleaned with our softwashing techniques. We have the equipment and skill to clean all the exterior surfaces of your Wellfleet business. Restore the view and keep your windows safe from etching. Call today for an affordable estimate. If you would like an estimate for Roof Cleaning or Fence cleaning in Wellfleet, please call 508-209-7795 or complete our online request form.